On its formation in 1645 the regiments of the New Model were organized on the basis of the existing units from which they originated. There were gradual changes due to alterations to establishment, reflecting a constant lack of manpower. Initially a regiment of New Model infantry would have 1,200 men at full establishment. These were organized in ten unequally sized companies: the colonel's company had 200 men, the lieutenant-colonel's 160, the sergeant-major's 140, and each of the seven captains' companies 100 men. It was rare to see a regiment at full strength, however; 700 was considered a very strong establishment, and 300 to 500 was typical. It was normal for this to be reflected in a reduction in the number of captains' companies, rather than an even reduction in company strength throughout the unit. 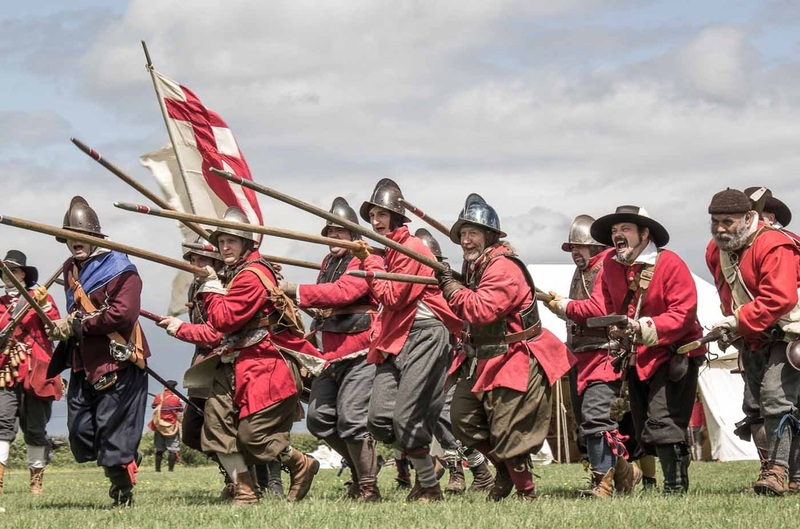 The companies were each made up of two-thirds musketeers and one-third pikemen. The company would muster in a six-deep formation, with two bodies of musketeers flanking the pikemen. A further sub-division existed in the file of six men, led by a file leader; the file leaders made up the front rank of the company, and were, presumably, steady and reliable soldiers. The officers generally comprised a captain in command, a lieutenant as second-in-command, and an ensign who carried the company colour. There were generally three or four sergeants, responsible both for the overall appearance of the company on the march or in the line of battle, and for supplies of match, powder and so forth. Other grades appear to have been present in varying numbers. There was, for example, no fixed ratio of corporals to numbers of men, as they seem to have been appointed at regimental level to suit company needs. Their role was not so much disciplinary-as was the case with sergeants-but more as instructors. It was the corporal who demonstrated to the newly joined recruit the drill with pike and musket. Also on the strength were two drummers per company, who played an important role. All manoeuvring on the field of battle or on the march was controlled by drums, which had eight basic calls. The 'call' passed the order to muster on the company colour, and the ‘troop' signalled a ready position. 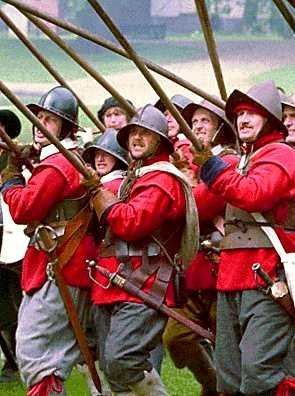 'Preparative' was the signal to close ranks and adopt fighting stance, and was followed by the 'battle' or 'charge', depending on the circumstances. If things went badly the 'retreat' signalled withdrawal; and the 'march' meant just that. 'Revalley' and 'tattoo' were peaceful camp signals. 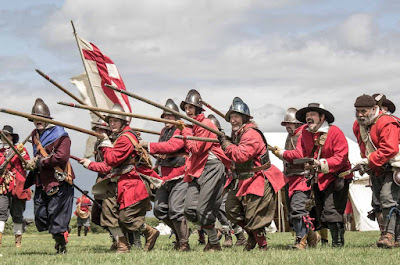 The well-organized company was purely an administrative unit however; on the battlefield the regiment would deploy in three bodies, each a larger-size copy of the company deployment, with wings of musketeers flanking a central body of pikes. At both company and regimental level these bodies of men were termed 'divisions', which seem to have had a fairly loose definition. Assuming full regimental strength deployed for battle in three bodies in a six-deep formation, regimental frontage would be something in the region of 250 yards, although this figure probably varied considerably with the irregular establishments mentioned above. The whole regiment would be commanded by the lieutenant-colonel: the colonel himself was generally a titular commander only, and was usually a general officer anyway. The pike was considered a more honourable weapon than the musket, and the regimental colours-one per company-were carried in their ranks when in battle. Gradually the discrepancy between company strengths seems to have disappeared, but in the mid-I650s the New Model regiments were still formed of uneven companies. Those of the colonel, lieutenant-colonel and sergeant-major had 145 men each, and the remaining seven companies 109 men each, giving an overall theoretical strength of 1,198, plus officers. The term 'officer' is one which was rather loosely applied in the mid-17th century, covering a colonel, a sergeant and even a drummer: in other words, any man who did not muster in the main body of regimental rank and file. Assuming this meaning, the total establishment would be 1,298, a figure rarely, if ever, achieved. There are indications that by the time of the Restoration, New Model companies were of equal size and that the establishment norm had become 1,000 men.